Legend believes Chelsea boss will move to Paris Saint-Germain | The Transfer Tavern | Where football transfer rumours fly or die! Chelsea fans in the Transfer Tavern are reacting to more reports that link their prestigious manager with a move to France and are wondering whether they should allow the Portuguese man to leave West London. Former Tottenham Hotspur winger David Ginola told BT Sport that he believes Jose Mourinho will be at Paris Saint-Germain next season, along with Real Madrid superstar Cristiano Ronaldo. Mourinho is under immense pressure with Chelsea this season, with the Blues losing a staggering seven of their opening Premier League matches and sitting in 16th position in the table; just three points above the relegation zone. 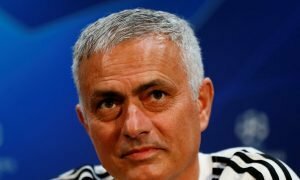 Already 13 points behind a spot in the top-four, the likelihood is that Mourinho will leave next summer if the Blues cannot achieve a Champions League finish- and Paris Saint-Germain is touted as the next destination for the former Real Madrid boss. If results continue to be lacklustre, then Mourinho may actually be on his way out before the season draws to a close. Chelsea fans, is it time to replace Jose Mourinho? Let us know in the comments below!